1. Always use your Invisalign case to store your aligners. your pocket, or the bottom of your purse. Also, dogs love to chew on things with their owner’s saliva on it – not pleasant but true. Keeping the aligners in the case protects them from becoming an expensive chew toy for your furry friend. 3. Use a removal tool. 4. Soak your trays while you eat. The aligners will be in your mouth a lot, at least 20 hours a day.During that time, they can pick up unpleasant odors or become stained. Avoid these problems by soaking your aligners in denture cleaner or a diluted, dye-free mouthwash solution while you eat. When your meal is finished, simply brush, floss, and pop your fresh-tasting aligner back in. 5. Avoid setbacks in your treatment by setting alarms. For some people, remembering to put the aligners back in after a meal or break is their biggest challenge. Set a timer on your phone, watch, or computer when you remove the aligner so you will be reminded to put them back in. This system helps to assure that you get the results in want in a timely fashion. 6. Don’t change aligners before a presentation or other speaking event. 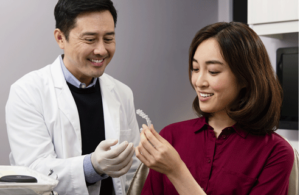 Many Invisalign users find they have a slight lisp when they start a new aligner, but it goes away within a few days. For this reason, if you have a speaking engagement, important meeting, or other critical event, you may wish to delay changing to the next aligner until later, so you can be lisp-free. At DeDomenico Orthodontist, we are committed to making your braces as experience a positive one. more, and select the office which is best for you.